Above: Diorama reconstruction of Cretaceous sealife that once lived in Tennessee; on exhibit at the American Museum of Natural History, New York. Photograph by Jonathan R. Hendricks. Ammonoidea, or ammonoids, constitute one of the most important clades of extinct invertebrate animals. Their lovely shells have long made them favorites of collectors and their fossils have been known since ancient times. For example, Pliny the Elder (AD 23-79) commented that: "'Hammonis cornu,' or 'horn of Ammon,' which is among the most sacred stones of Ethiopia, has a golden yellow colour and is shaped like a ram's horn. The stone is guaranteed to ensure without fail dreams that will come true" (Pliny the Elder, Book 37). Regardless of their purported powers of making dreams come true, the shape mentioned by Pliny the Elder is what gives the ammonoids their name: Amum (Ámmōn, in Greek) was an Egyptian god sometimes associated with the ram. Note that the term ammonite is sometimes used interchangeably with ammonoid. This is not quite correct, as ammonites are a particular group of Ammonoidea. Ammonoids originated in the Devonian period and have a fossil record that spans until the end of the Cretaceous period, when they went extinct. 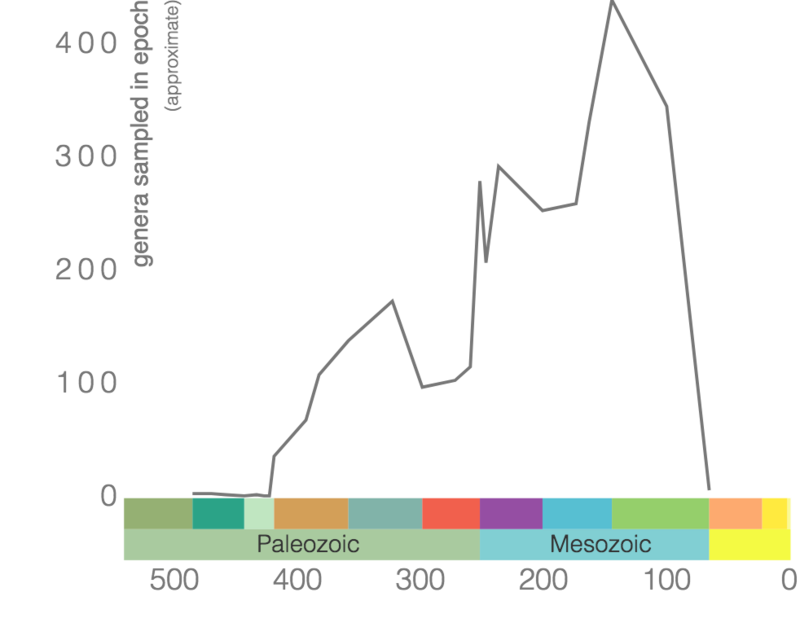 Phanerozoic genus-level diversity of Ammonoidea (graph generated using the Paleobiology Database Navigator). 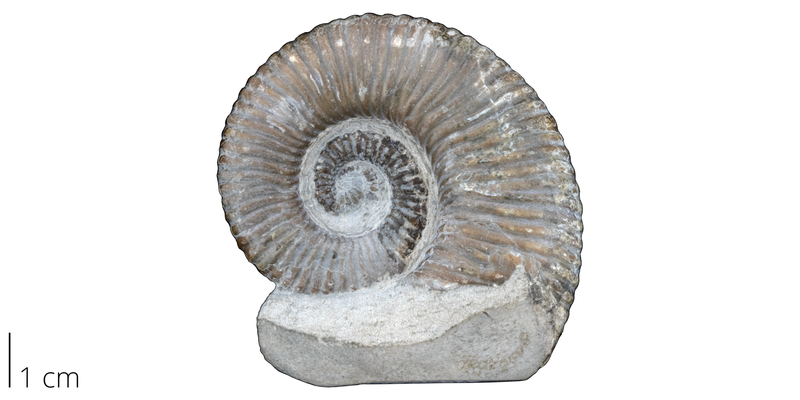 Over 8,000 species of ammonoids have been described (to generate a list of your own using the Paleobiology Database, click here and search for "Ammonoidea") and are represented by a great diversity of forms. 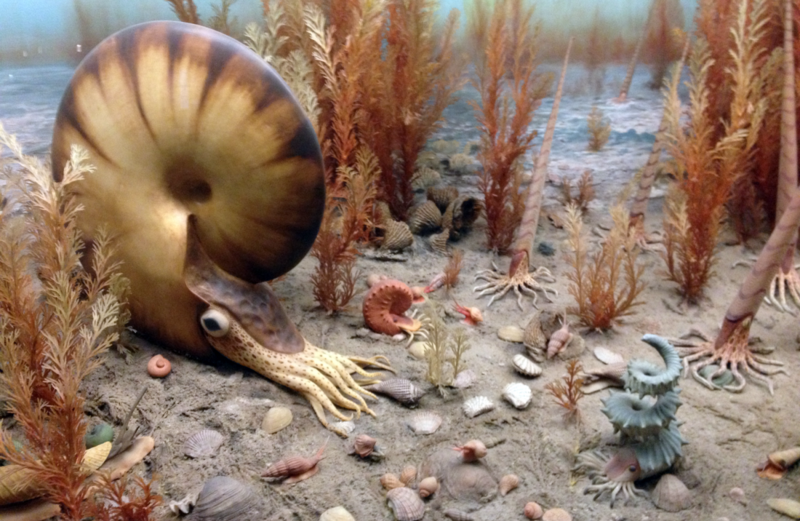 Because they were swimming animals, many ammonoid species attained very large geographic ranges. Because of this, the fossils they left behind are ideal for biostratigraphy. 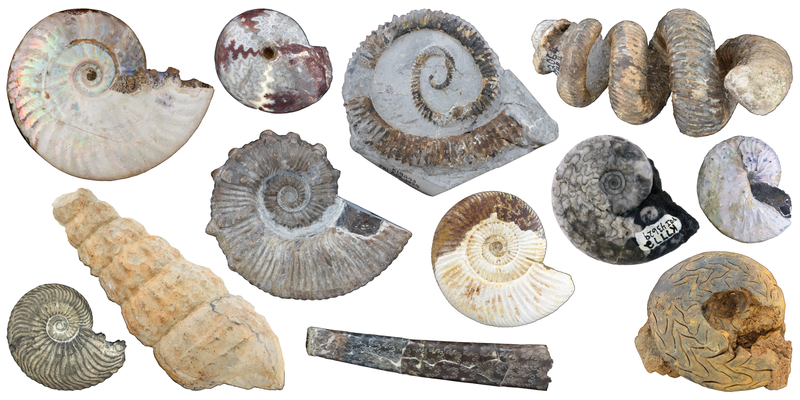 Examples of different shapes of ammonoid shells. Image by Jonathan R. Hendricks. Phylogenetically, ammonoids (as well as a few other much smaller groups, not covered here) are considered to be stem-group coleoids (Kroger et al., 2011). This means that they were more closely related to modern squids, cuttlefish, and octopuses than they are to nautiloids (including the chambered nautilus). Highly simplified overview of cephalopod phylogeny based in part on the hypothesis of relationships presented by Kröger et al. (2011). Image by Jonathan R. Hendricks. Even though ammonoids had external shells that were somewhat similar to those of the modern chambered nautilus, the animals themselves were likely quite different, especially in terms of their styles of development and life history. The video below considers the question of why the ammonoids--but not the nautiloids--were wiped out by the end-Cretaceous mass extinction event and what this might have to do with these biological differences. Source: "Science Bulletins: Sea Creatures Face the Acid Test" by American Museum of Natural History. The original external shell of ammonoids is sometimes preserved, though is commonly eroded or broken away. In such cases, only the sediment that filled the internal chambers following death may be preserved. Such fossils are often not rendered impossible to identify, however, as evidence of the sutures that separated the chambers may be present. The complex shapes of these sutures are very diagnostic for ammonoids and can often allow specimens to be identified to the species level, even when the external shell is lost. The "center" of the ammonoid shell--the axis around which the shell grows--is called the umbilicus; it forms a depression in many species. 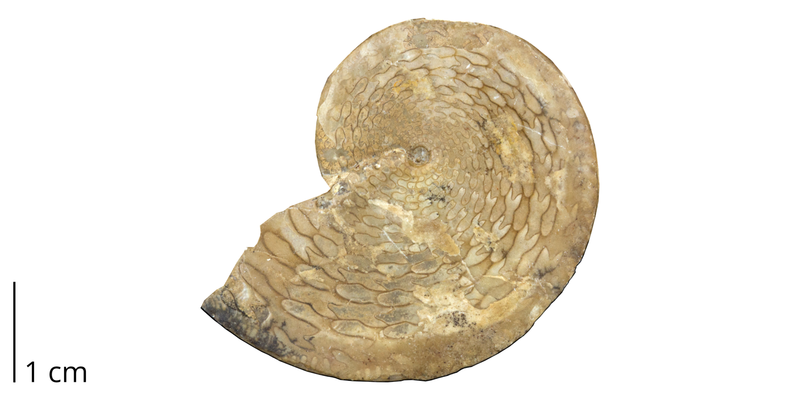 A specimen of the ammonite Prososphinctes virguloides, showing the relationship between the original shell and the internal sutures that are visible in places where the shell is broken away. Note that the sutures were not visible when the animal was alive. From the collections of the Paleontological Research Institution (PRI 70577). Image by Jonathan R. Hendricks. 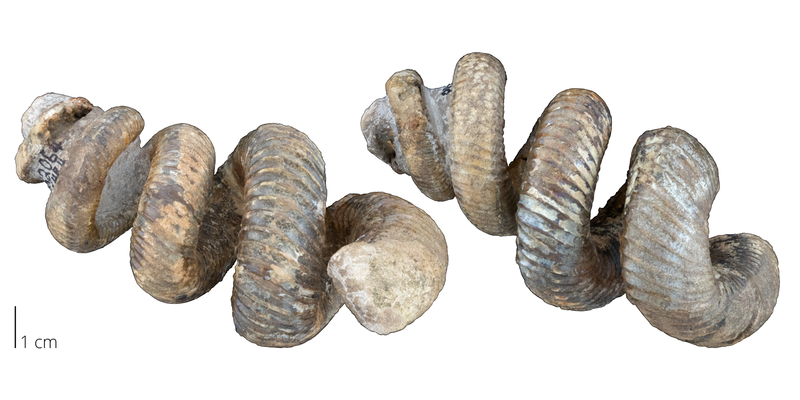 Most ammonoids had tightly-coiled planispiral (coiled in a single plane) shells, though heteromorph ammonoids deviated from this style of coiling (see examples near end of this page). Evolute, convolute, and involute planispiral coiling are all common in ammonoids. 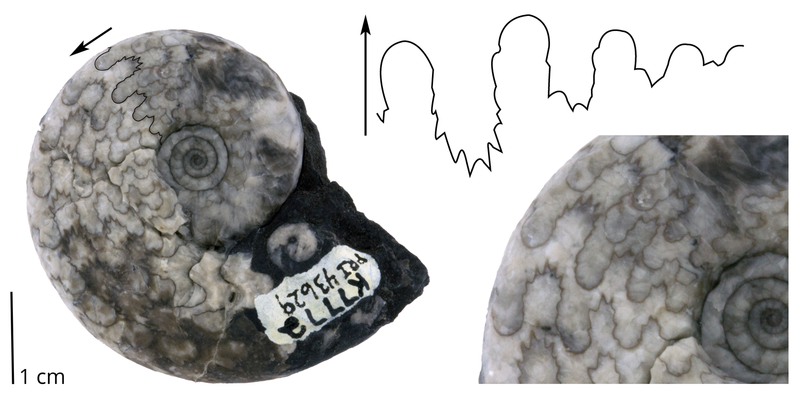 Newly formed whorls barely overgrow prior whorls in ammonoid species with evolute coiling. Left: cartoon illustration of a cephalopod shell with evolute coiling. Right: specimen of the ammonite Prososphinctes virguloides, which has evolute coiling; from the collections of the Paleontological Research Institution, Ithaca, New York. (PRI 70577). Image by Jonathan R. Hendricks. 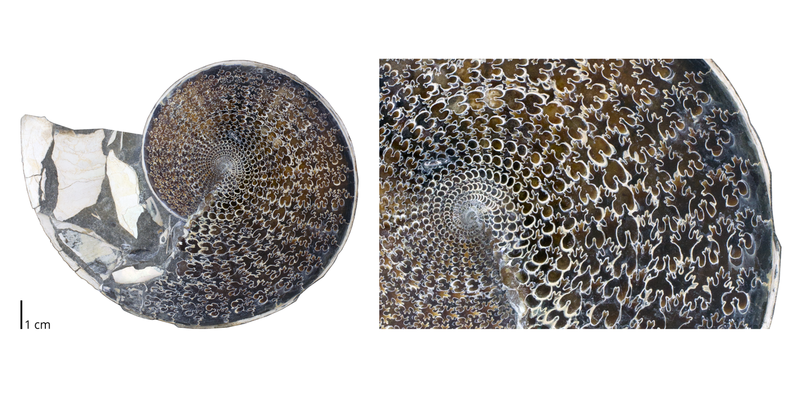 Interactive model of the ammonite Perisphinctes from the Jurassic period, demonstrating shell evolute coiling. Specimen is from the collections of the Paleontological Research Institution, Ithaca, New York. Maximum diameter of specimen is approximately 7.5 cm. Model by Emily Hauf; Creative Commons Attribution-ShareAlike 4.0 International license (CC BY-SA 4.0). Newly formed whorls partially overgrow prior whorls in ammonoid species with convolute coiling. Left: cartoon illustration of a cephalopod shell with convolute coiling. Right: specimen of the ammonite Quenstedtoceras sp., which has convolute coiling; from the collections of the Paleontological Research Institution, Ithaca, New York (PRI 70591). Image by Jonathan R. Hendricks. Newly formed whorls completely overgrow prior whorls in ammonoid species with involute coiling. 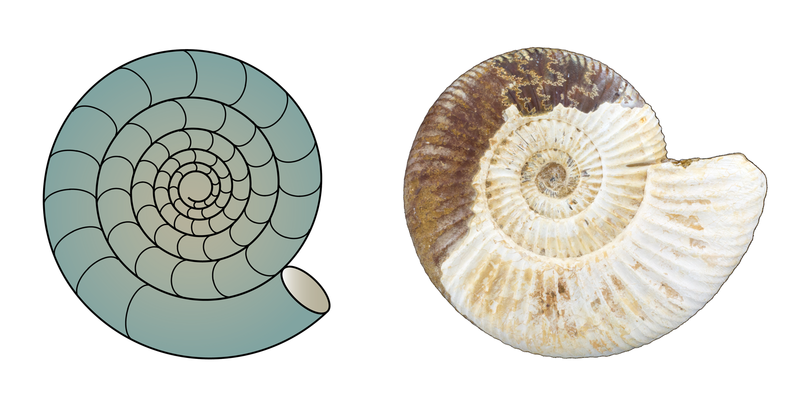 Left: cartoon illustration of a cephalopod shell with involute coiling. Right: specimen of the ammonoid Medliocottia intermedius, which has involute coiling; from the collections of the Paleontological Research Institution, Ithaca, New York (PRI 70568). Image by Jonathan R. Hendricks. 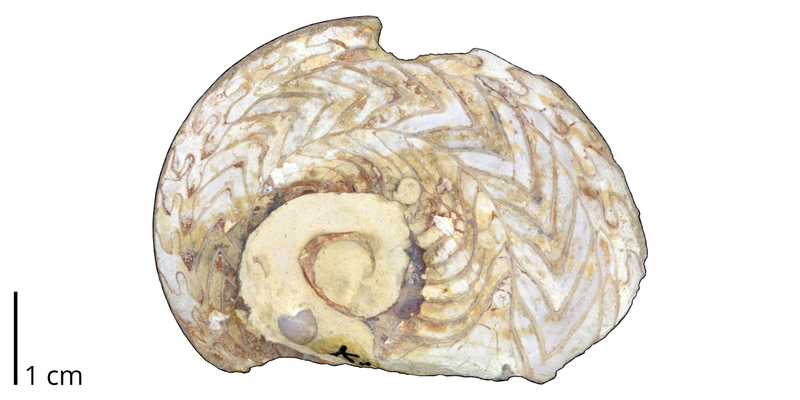 Interactive model of ammonite Oppelia subradiata from the Jurassic Interior Oolite of de Bayeux, France, demonstrating involute shell coiling. Specimen is from the collections of the Paleontological Research Institution, Ithaca, New York (PRI 76760). Maximum diameter of specimen is approximately 10 cm. Model by Emily Hauf; Creative Commons Attribution-ShareAlike 4.0 International license (CC BY-SA 4.0). Unlike the simply curved sutures of the modern chambered nautilus--as well as those of most ancient nautiloids--the sutures of ammonoids were complex in shape. These complexities make them very useful for distinguishing species. Curves along the length of the suture are known as saddles and lobes. 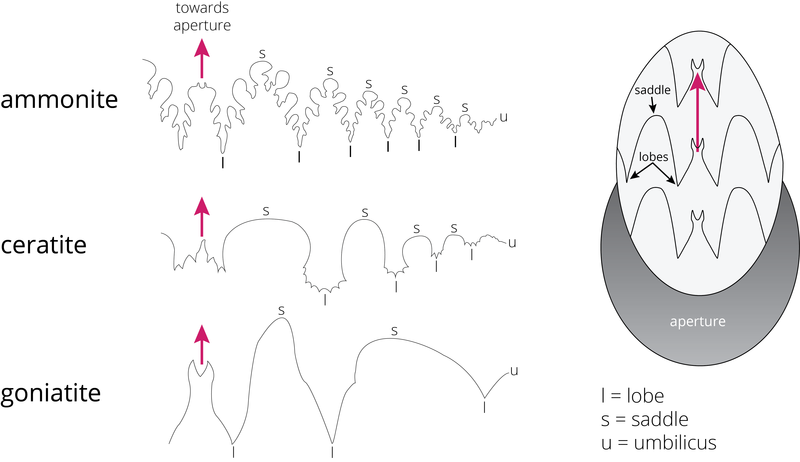 Saddles are convex towards (i.e., point towards) the aperture. Lobes, on the other hand, are convex towards the protoconch (i.e., in the opposite direction of saddles). 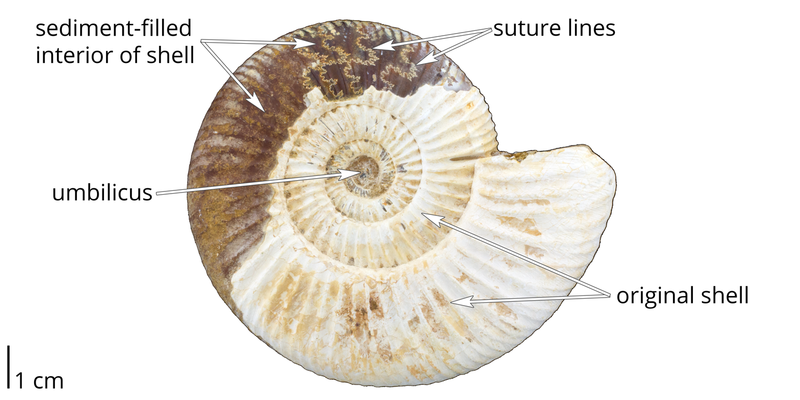 Most formal taxonomic descriptions of ammonoid species are accompanied by "suture diagrams" that show the trace of a given suture line from the umbilicus to the top of the shell (and sometimes to the umbilicus on the opposite side). As a matter of convention, saddles are drawn such that they point upwards on these diagrams. Spend some time looking at the diagram below so that you can differentiate saddles from lobes, as well as understand the relationship between a suture diagram and the shell from which it is drawn. Saddles and lobes are also identified on the interactive model shown below. Morphology of ammonoid sutures. 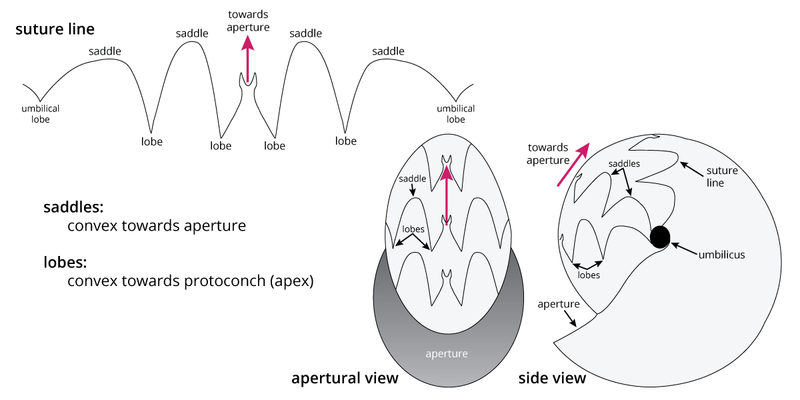 Note that saddles are convex towards (i.e., point towards) the aperture; lobes are convex towards the protoconch (i.e., in the opposite direction of saddles). Image by Jonathan R. Hendricks. Interactive model of the ammonoid cephalopod Medlicottia intermedia from the Permian of Kazakhstan; saddles and lobes are identified along one suture. Note that the external shell of this specimen is absent. Specimen is from the collections of the Paleontological Research Institution, Ithaca, New York (PRI 70568). Maximum diameter of specimen is approximately 4.5 cm. Model by Emily Hauf; Creative Commons Attribution-ShareAlike 4.0 International license (CC BY-SA 4.0). Ammonoid sutures fall into three main groups: goniatites, ceratites, and ammonites. Goniatitic sutures do not have subdivided saddles or lobes. Ceratitic sutures have subdivided lobes, but undivided saddles. Finally, both the saddles and lobes of ammonitic sutures are subdivided, sometimes in an amazingly complex fashion. Knowing just a little bit about the sutures of ammonoids is incredibly useful for students of geology and paleontology. In fact, being able to distinguish the three major types of ammonoid sutures can help a geologist or paleontologist quickly determine the relative age of a rock sample containing an ammonoid fossil. While some exceptions exist (as they always do in nature), most Paleozoic ammonoids (i.e., Devonian to Permian species) have goniatitic stutures; most Triassic species have ceratitic sutures; and most Jurassic and Cretaceous species have ammonitic sutures. Thus, if you find an ammonoid fossil in a rock, you can tell roughly how old the specimen is based simply upon what kind of suture it has! Examples of goniatite, ceratite, and ammonite sutures. Image by Jonathan R. Hendricks. 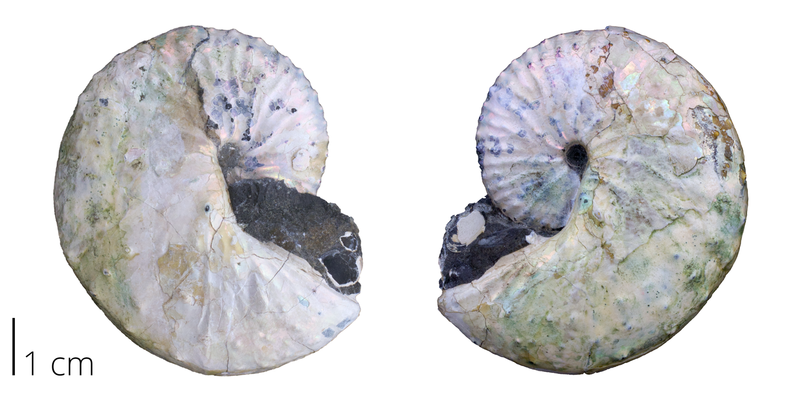 Examples are shown below of ammonoids with goniatite, ceratite, and ammonite suture patterns. Make sure that you can tell them apart. 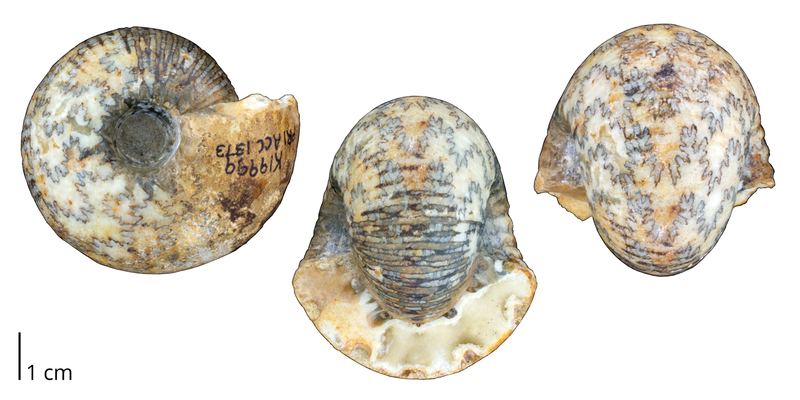 Neodimorphoceras plummerae from the Pennsylvanian Finish Shale of Jack County, Texas. Specimen from the collections of the Paleontological Research Institution (PRI 70570). Image by Jonathan R. Hendricks. Pseudopara legoceras from the Pennsylvanian Atoka Formation of Oklahoma. 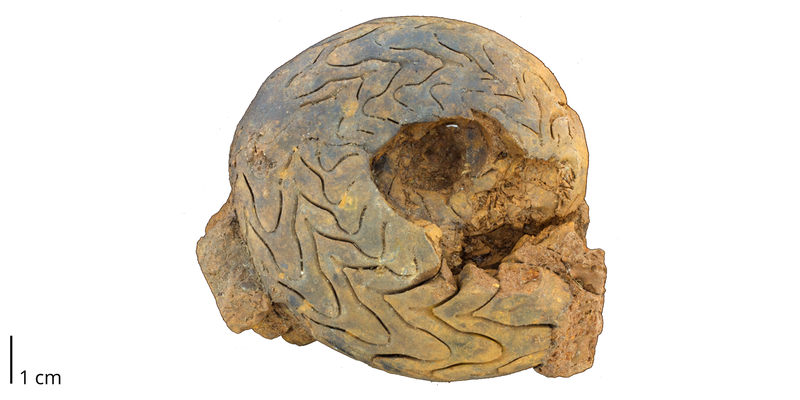 This fossil is preserved as an internal mold; no original shell material remains (thus, the "sutures" are preserved as gaps between sediment-filled chambers). Specimen from the collections of the Paleontological Research Institution (PRI 44564). Image by Jonathan R. Hendricks. Interactive 3D model of the goniatite ammonoid Tornoceras uniangulare from the Devonian Geneseo Shale of Tomkins County, New York (PRI 55004). Specimen is from the collections of the Paleontological Research Institution, Ithaca, New York. Maximum diameter of specimen is approximately 6 cm. Zoom in to see the goniatite suture pattern of this species. Model by Emily Hauf; Creative Commons Attribution-ShareAlike 4.0 International license (CC BY-SA 4.0). Gymnotoceras beachi from the Triassic Toad Formation of northern British Columbia. Most of the original shell of this specimen is completely gone. From the collections of the Paleontological Research Institution, Ithaca, New York (PRI 43629). An interactive 3D model of this specimen is below. Image by Jonathan R. Hendricks. 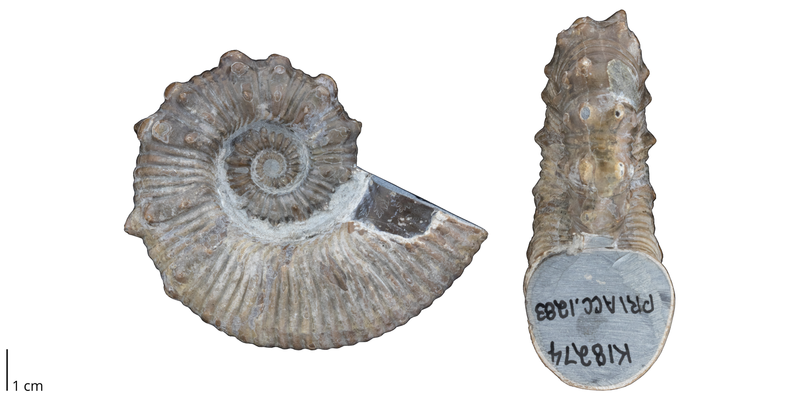 The ceratite ammonoid Gymnotoceras beachi from the Triassic Toad Formation of British Columbia (PRI 43629). Specimen is from the collections of the Paleontological Research Institution. Maximum diameter is approximately 4.5 cm. See photographs of this specimen immediately above. Model by Emily Hauf; Creative Commons Attribution-ShareAlike 4.0 International license (CC BY-SA 4.0). Medliocottia intermedius from the Permian of the Ural Mountains, Russia. While ceratite sutures are characteristic of the Triassic, this is a rare example of a late Paleozoic species that bears such a suture. Specimen is from the collections of the Paleontological Research Institution, Ithaca, New York (PRI 70568). An interactive 3D model of this specimen was shown earlier on this page. Image by Jonathan R. Hendricks. Arcestes pannonicus from the Triassic of Italy. This ammonoid is a rare example of a Triassic species with an ammonitic suture. Specimen is from the collections of the Paleontological Research Institution, Ithaca, New York (PRI 70569). Image by Jonathan R. Hendricks. 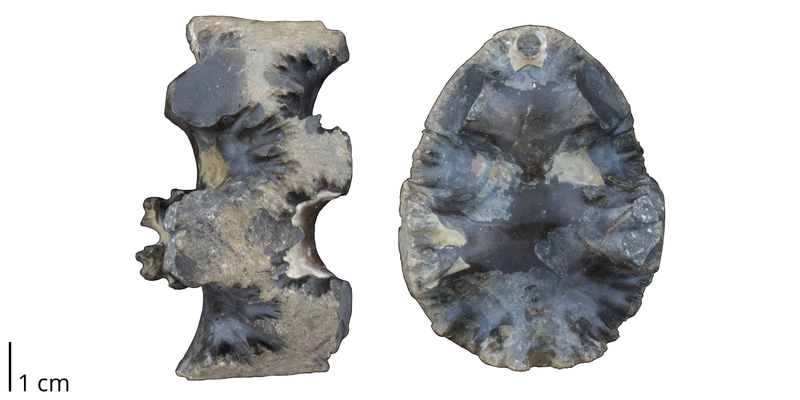 Cadoceras sublaevis from the Jurassic of central England. Note that the original shell is almost completely removed. Collections of the Paleontological Research Institution, Ithaca, New York (PRI 70580). An interactive 3D model of this specimen is shown below. Image by Jonathan R. Hendricks. 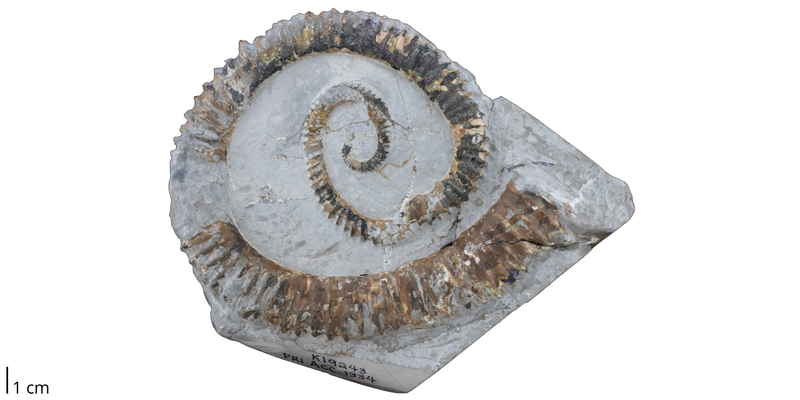 Interactive 3D model of the ammonoid cephalopod Cadoceras sublaeve from the Jurassic (Callovian) of Gloucestershire, England (PRI 70580). Specimen is from the collections of the Paleontological Research Institution. Largest dimension is about 5.5 cm. Photographs of this specimen are immediately above. Model by Emily Hauf; Creative Commons Attribution-ShareAlike 4.0 International license (CC BY-SA 4.0). Sphenodiscus lenticularis; from the collections of the Paleontological Research Institution, Ithaca, New York. Image by Jonathan R. Hendricks. Cleoniceras besairiei from the Cretaceous period. Note the the original shell exhibits and iridescent sheen. Specimen from the collections of the Paleontological Research Institution. An interactive 3D model of this specimen is below. Image by Jonathan R. Hendricks. Interactive 3D model of the ammonoid Cleoniceras besairiei from the Cretaceous period. Specimen is from the collections of the Paleontological Research Institution, Ithaca, New York. Maximum diameter of specimen is approximately 12 cm. Photographs of this specimen are immediately above. Model by Emily Hauf; Creative Commons Attribution-ShareAlike 4.0 International license (CC BY-SA 4.0). Quenstedtoceras sp. from the Jurassic of Bavaria. Collections of the Paleontological Research Institution (PRI 70591). Image by Jonathan R. Hendricks. The ammonite Spenodiscus lenticularis, from the collections of the Paleontological Research Institution, Ithaca, New York. 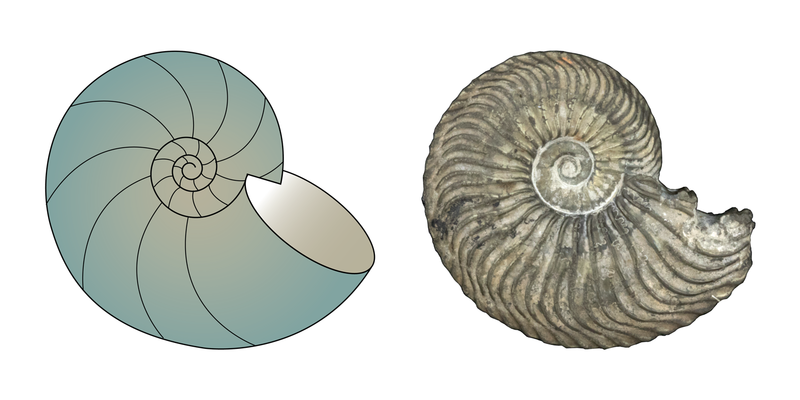 While most ammonoids had planispiral shells, very different shell shapes evolved in some ammonite groups. The video below by ammonite expert Dr. Neil Landman (American Museum of Natural History) highlights some of these differences. Source: "The Amazing Shapes of Ammonites" by the American Museum of Natural History. Discoscaphites conradi from the Cretaceous (Maastrichian) Fox Hills Formation of South Dakota. Note that the original shell exhibits an iridescent sheen and bears a couple of rows of spines. Specimen from the collections of the Paleontological Research Institution (K21324). Image by Jonathan R. Hendricks. Tropaeum sp. from Queensland, Australia. Specimen from the collections of the Paleontological Research Institution (PRI 70589). Image by Jonathan R. Hendricks. Australiceras jacki from the Cretaceous of Queensland, Australia. Note the presence of spines on the shell. Specimen is from the collections of the Paleontological Research Institution (PRI 70599). Image by Jonathan R. Hendricks. 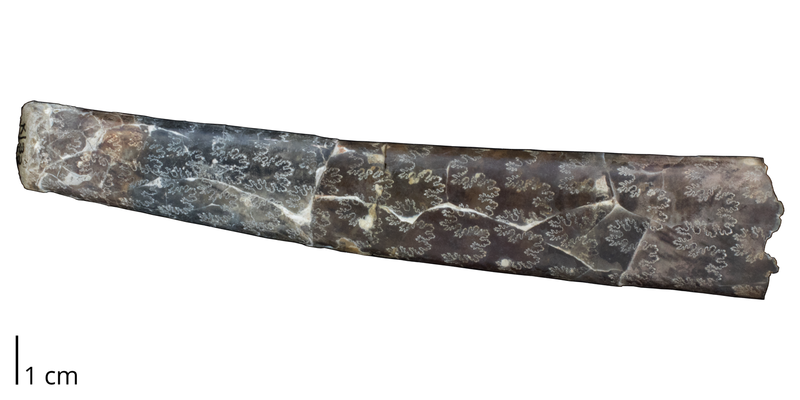 Aegocrioceras raricostatum from the Cretaceous of Germany (collections of the Paleontological Research Institution, PRI 70596). 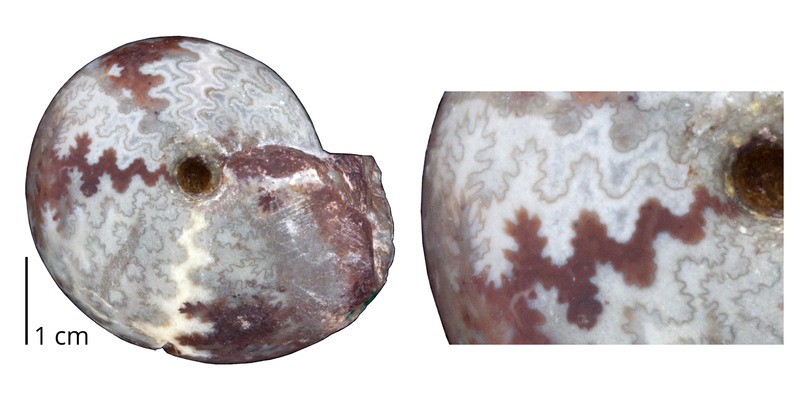 This species has an open coil (younger whorls do not make contact with older whorls). 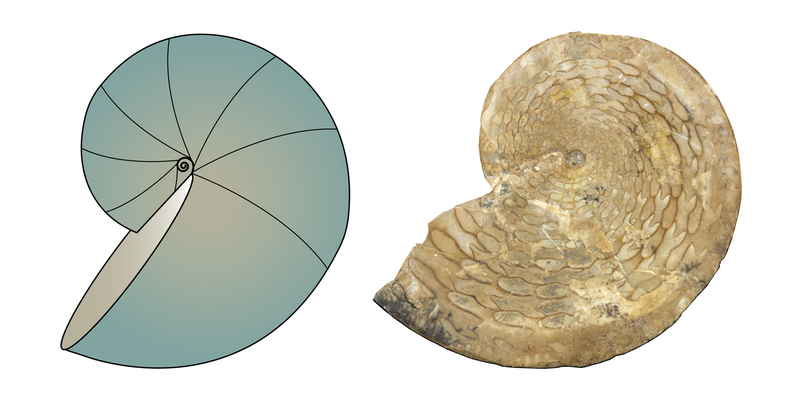 Because growth is within a single plane, this shell is also considered planispiral. Image by Jonathan R. Hendricks. 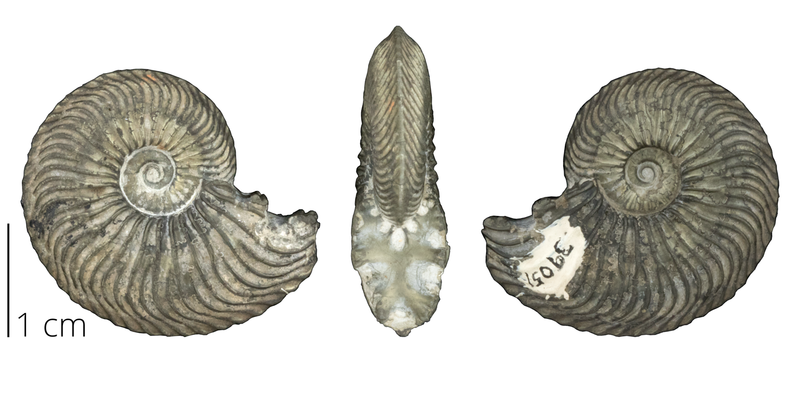 Diplomoceras maximum from the Cretaceous of Seymour Island, Antarctica. 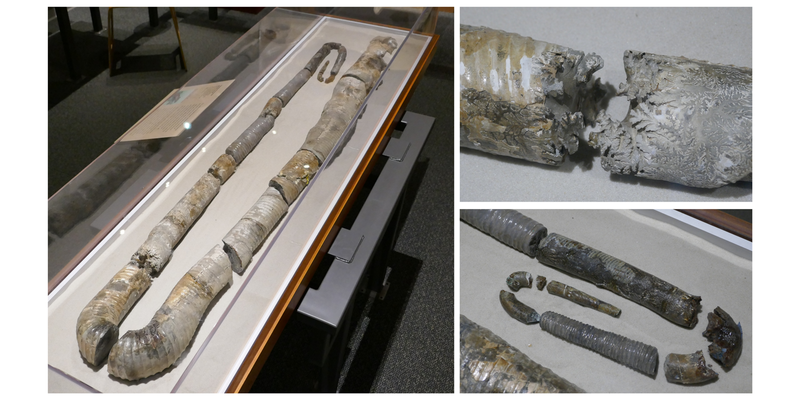 This large (coiled, 1.5 m long; uncoiled, >4 m long) specimen is on public display at the Museum of the Earth, Ithaca, New York (PRI 13889). An interactive 3D model of this specimen is below. Image by Jonathan R. Hendricks. Interactive 3D model of the heteromorph ammonoid Diplomoceras maximum, on display at the Museum of the Earth in Ithaca, New York (PRI 13889). This specimen was discovered by Dr. William Zinsmeister and Dr. Anton Oleinik in Cretaceous-aged rocks on Seymour Island, Antarctica. The complete length of this twisted ammonoid’s shell is approximately 4 meters. Photographs of this specimen are immediately above. Model by Emily Hauf; Creative Commons Attribution-ShareAlike 4.0 International license (CC BY-SA 4.0). Toxoceratoides sp. from the Cretaceous (Aptian) of Queensland, Australia. Specimen from the collections of the Paleontological Research Institution (PRI 70597). Image by Jonathan R. Hendricks. Turrilities costatus from the Cretaceous (Cenomanian) of England. Note that the torticone coil of this shell makes it strongly resemble a high-spired gastropod. Specimen is from the collections of the Paleontological Research Institution (PRI 70593). Image by Jonathan R. Hendricks. Interactive 3D model of the heteromorph (torticone) ammonite Hypoturrilites gravesianus from the Cretaceous of Kent, England (PRI 76777). Specimen is from the collections of the Paleontological Research Institution, Ithaca, New York. Length of specimen is approximately 10.5 cm. Model by Emily Hauf; Creative Commons Attribution-ShareAlike 4.0 International license (CC BY-SA 4.0). Uncoiled heteromorph ammonite Didymoceras otsukai from the Cretaceous period. An interactive model of this fossil is below. Image by Jonathan R. Hendricks. Interactive 3D model of the uncoiled heteromorph ammonite Didymoceras otsukai from the Cretaceous period. Photographs of the specimen are above. Model by Emily Hauf; Creative Commons Attribution-ShareAlike 4.0 International license (CC BY-SA 4.0). Baculites were a group of ammonoids with nearly straight shells and ammonitic sutures. Most specimens are typically fragmentary. Baculites compressus from the Cretaceous Pierre Shale of South Dakota. This specimen is relatively complete compared to most baculite specimens, which are often quite fragmentary. Note that the original external shell is completely missing from this specimen, allowing the ammonitic sutures below to be observed. 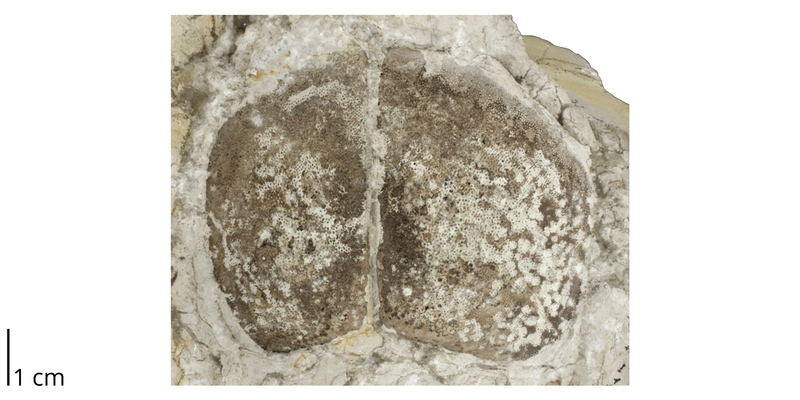 Specimen from the collections of the Paleontological Research Institution (PRI 70603). An interactive model of this specimen is below. Image by Jonathan R. Hendricks. 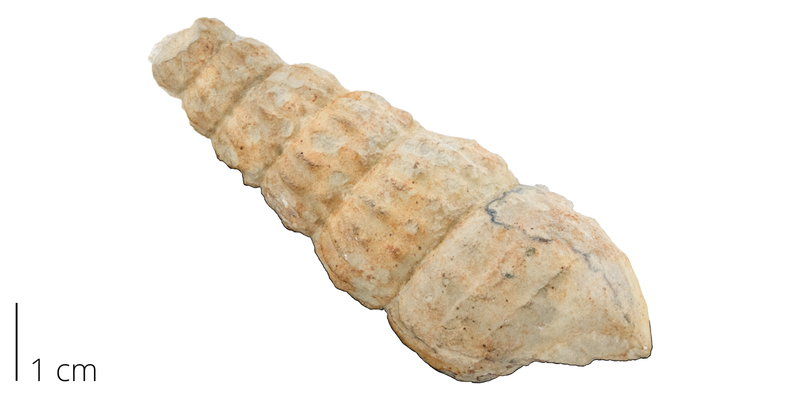 Interactive 3D model of the ammonoid cephalopod Baculites compressus from the Cretaceous Pierre Shale of South Dakota (PRI 44571). Specimen from the collections of the Paleontological Research Institution, Ithaca, New York. Specimen is approximately 15.5 cm. A photograph of this specimen is immediately above. Model by Emily Hauf; Creative Commons Attribution-ShareAlike 4.0 International license (CC BY-SA 4.0). Fragment of Baculites sp. from the Cretaceous (locality unknown). 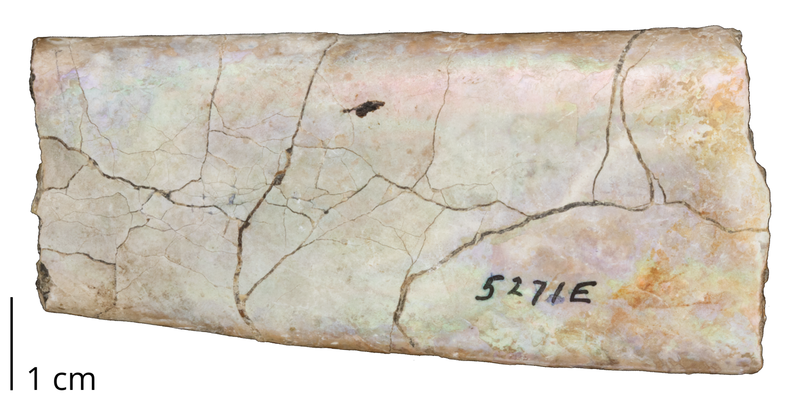 Note the preservation of the original shell, which has an iridescent sheen. Specimen from the collections of the Paleontological Research Institution (PRI 70600). Image by Jonathan R. Hendricks. Interactive 3D model of the baculite Baculites sp. from the Cretaceous Pierre Shale of Wasta, South Dakota (PRI 70605). Specimen is from the collections of the Paleontological Research Institution, Ithaca, New York. Maximum length of specimen is approximately 8.5 cm. Model by Emily Hauf; Creative Commons Attribution-ShareAlike 4.0 International license (CC BY-SA 4.0). A fragment of Baculites sp. fromt he Cretaceous Pierre Shale of South Dakota. Specimen is an internal mold of a baculite chamber (i.e., sediment that filled a once empty space); very little original shell material (light colored) remains. Specimen is from the collections of the Paleontological Research Institution (PRI 70605). An interactive model of this specimen is below. Image by Jonathan R. Hendricks. Interactive 3D model of a single sediment-filled chamber of the baculite ammonite Baculites sp. from the Cretaceous Pierre Shale of Wasta, South Dakota (PRI 70605). Specimen is from the collections of the Paleontological Research Institution, Ithaca, New York. Maximum length of specimen is approximately 7 cm. Photographs of this specimen are immediately above. Model by Emily Hauf; Creative Commons Attribution-ShareAlike 4.0 International license (CC BY-SA 4.0). 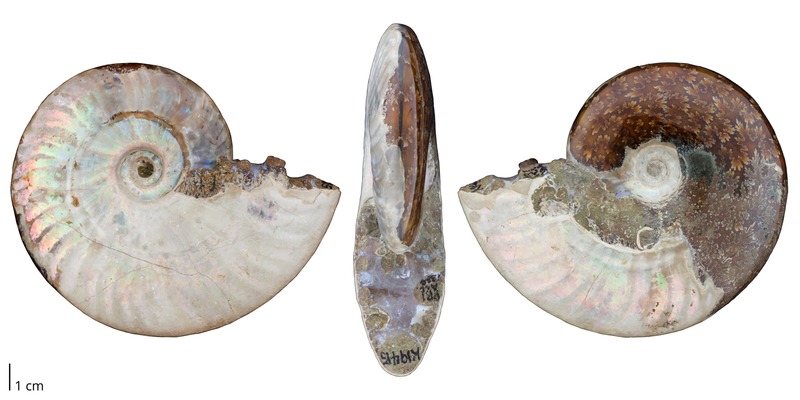 Aptychi are paired calcitic plates that look something like the shells of bivalve mollusks. Their occasional discovery in close proximity to ammonoid fossils has led to the conclusion that they are parts of the ammonoid body. The function(s) of these structures remain debated, however. For example, they might have functioned as jaw elements, been used in swimming, or served as operculum-like trap doors to close the shell (or some combination of these--or other--functions) (see Parent et al., 2014 for a recent review of possible functions). Aptychi pair from the Jurassic Solnhofen Limestone of Germany. Specimen from the collections of the Paleontological Research Institution, Ithaca, New York (K7689). Image by Jonathan R. Hendricks. 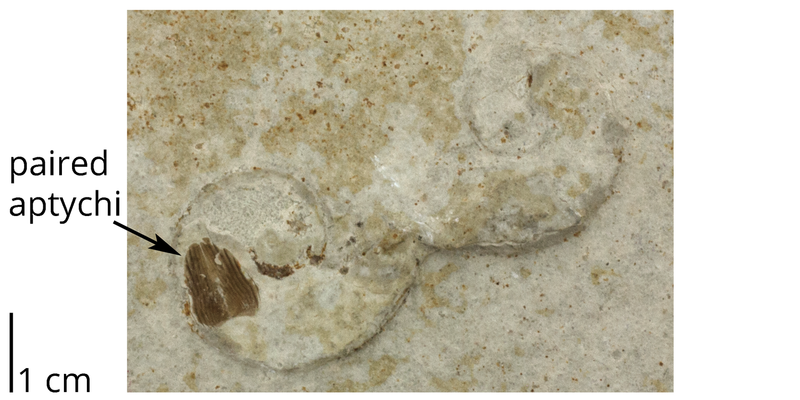 Paired aptychi preserved in the body chamber of an otherwise poorly preserved ammonoid (Lingulaticeras) from the Jurassic Solnhofen Limestone of Germany. Note the second ammonoid fossil to the right. Specimen is from the collections of the Paleontological Research Institution, Ithaca, New York (PRI 44640). Image by Jonathan R. Hendricks. Furnish, W. M., B. F. Glenister, J. Kullmann, and Z. Zuren. 2009. Treatise on Invertebrate Paleontology, Part L, Mollusca 4, Revised. Volume 2: Carboniferous and Permian Ammonoidea (Goniatitida and Prolecanitida). The University of Kansas, Paleontological Institute, Lawrence, 258 pp. Klug, C., D. Korn, K. De Baets, I. Kruta, and R. H. Mapes (eds.). 2015. 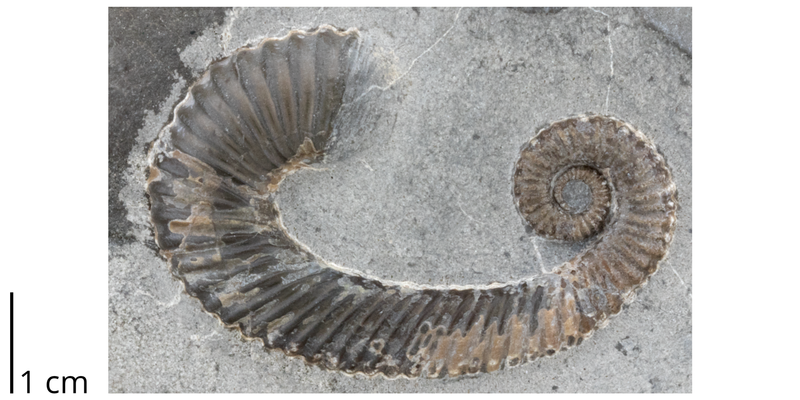 Ammonoid Paleobiology: From Anatomy to Ecology. Topics in Geobiology 43, Springer, 934 pp. Kröger, B., J. Vinther, and D. Fuchs. 2011. Cephalopod origin and evolution: a congruent picture emerging from fossils, development and molecules. Bioessays 33: 602-613. Link. Parent, H., G. E. G. Westermann, and J. A. Chamberlain Jr. 2014. Ammonite aptychi: functions and role in propulsion. Geobios 47: 45-55. Staaf, D. 2017. Squid empire: the rise and fall of the cephalopods. ForeEdge, 256 pp. Wright, C. W., J. H. Calloman, and M. K. Howarth. 1996. Treatise on Invertebrate Paleontology, Part L, Mollusca 4, Revised. Volume 4: Cretaceous Ammonoidea. The Geological Society of America, Inc. and The University of Kansas, Lawrence, 362 pp. Unless otherwise indicated, the written and visual content on this page is licensed under a Creative Commons Attribution-NonCommercial-ShareAlike 4.0 International License. This page was written by Jonathan R. Hendricks. See captions of individual images for attributions. See original source material for licenses associated with video and/or 3D model content.